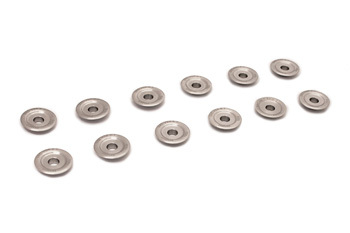 Made from a high-quality alloy steel that is both stronger and lighter than factory retainers, our Alloy Valve Retainers are engineered for excelent long term strength and durability on the street or track. Steel retainers are great for endurance racing, or a race vehicle that will not often see rebuilds. They can also be used for everyday street driving. This is a great do-it-all retainer with a fantastic track record. ** We now offer the retainers in Titanium for strength and lighter weight.